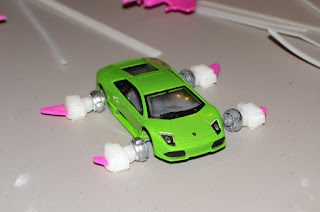 A while back I picked up a Hot Wheels "Custom Motors" kit that was about 1/43 scale with an option to create a flying car. I liked it quite a bit and it turned out looking really nice all painted up. The only problem was that there was only one model and I was only able to pick up one copy before they were off the shelves. 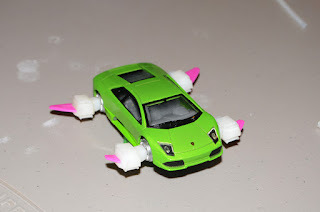 I really wanted more flying cars so I decided to try and make a few myself from other 1/43 scale cars. My first attempt is this flying Lamborghini. Here is the shot of the car with my scratch built repulsor drives. I made them mostly from different sized zip ties. The fins are from some super cheep toy airplane party favors I picked up at Dollar Tree. I stripped the tires off the wheels and took the axles out but used the plastic wheels to fill the wheel wells so the drives stuck out far enough. I've got a bit more work to do on this. I'm thinking of adding wings and some other bits. I kind of feel like the Hot Wheels car looked a bit over done but this one doesn't quite look finished so I think I'm going to add more.